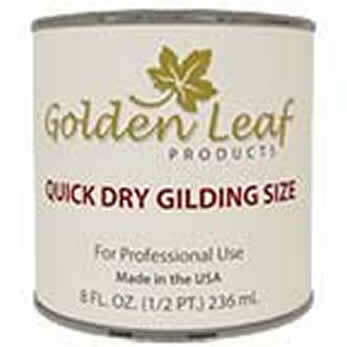 We offer a variety of different types of gilding adhesives, including oil base size, Water Based size, gelatin, and rabbit skin glue. Our oil base fast and slow size is excellent for all outdoor and indoor applications. Water Based size should only be used indoors, as it will loose its adhesive properties if it becomes wet. Gelatin sheets are used for water gilding on glass. Pieces of the gelatin sheets can be cut off and are dissolved in water before use. Rabbit skin glue is used to make gesso and is added to clay bole when water gilding. It will quickly dissolve in hot water and can be stored in the refrigerator for several weeks.